1. 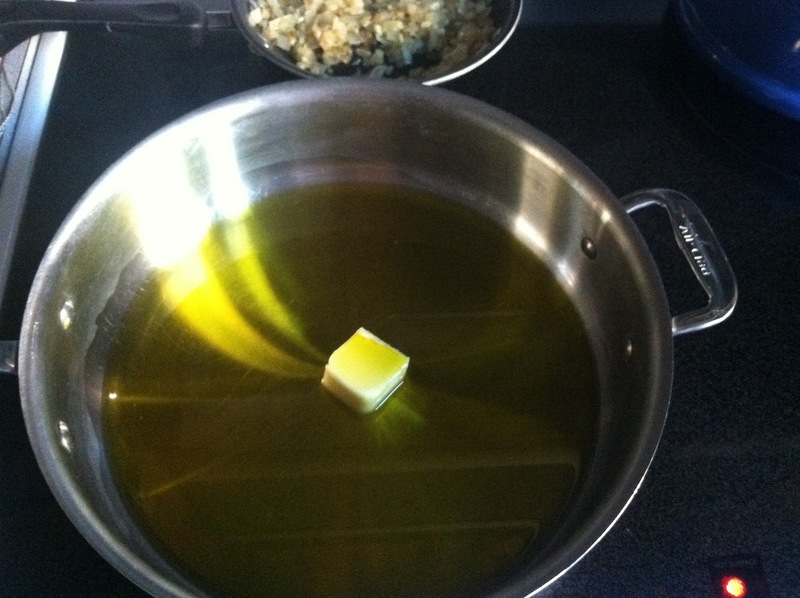 Heat 1 T. olive oil and 1 T. butter (or 2 T. olive oil instead of 1 and 1) in small saucepan. 2. When melted, add the diced vidalia onion and saute until soft. 4. Seed approx. 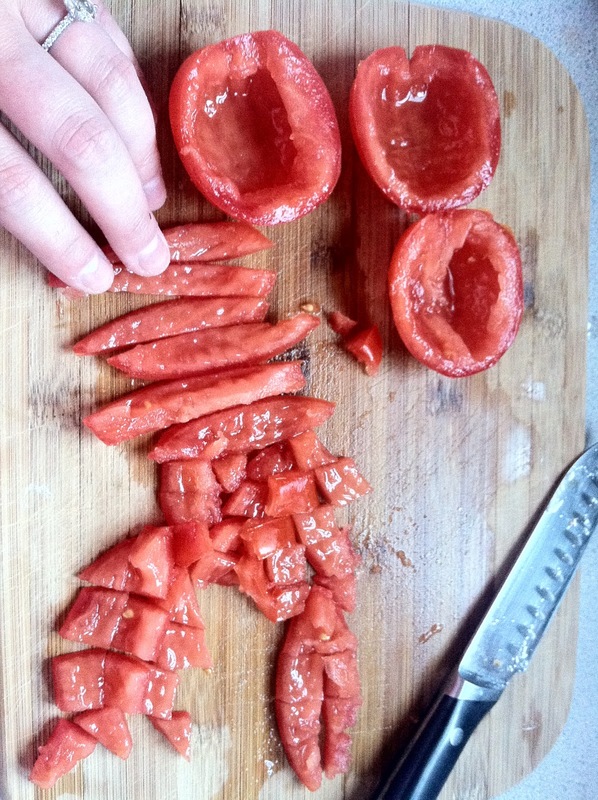 4 plum tomatoes (seeds make things kind of bitter) and dice, add to the onion/garlic mixture. Reduce heat to low and let simmer to blend flavors and ingredients while you prep the chicken. 5. 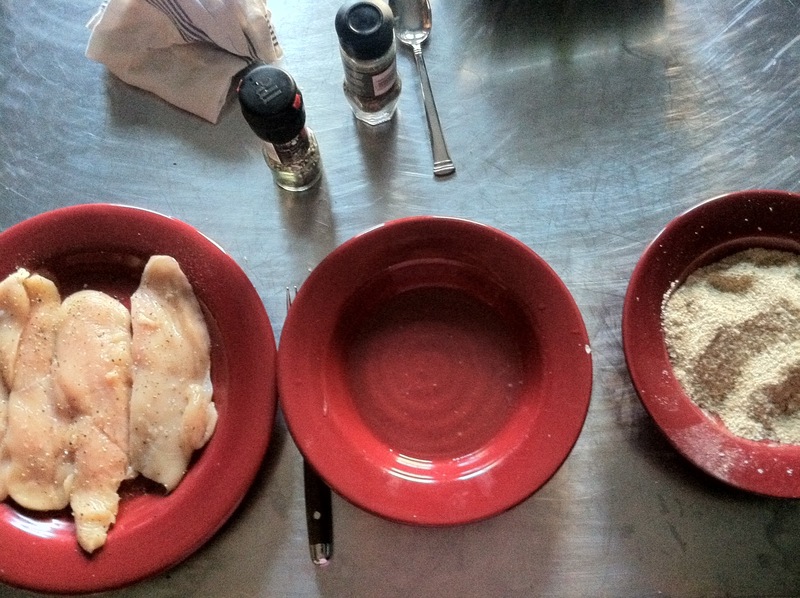 Rinse chicken and pat dry, season with salt and pepper. 6. 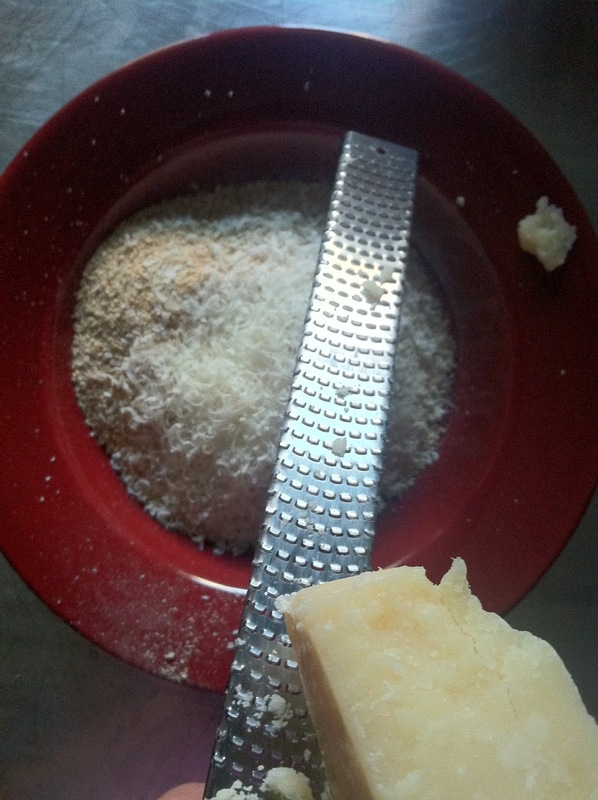 Arrange 2 bowls for breading: the first one should be a mix of the juice of one lemon and 2 tablespoons olive oil, whisked together, the second a mix of 3 cups breadcrumbs and grated parmesan. 7. Heat approx. 1/4 inch of olive oil (and 1 T butter, optional) in a large skillet. ** Alternatively, for a healthier version, you can bread the chicken, spray it with Pam olive oil cooking spray, and bake it in the oven at 350 for approx. 20 minutes, flipping once. 8. 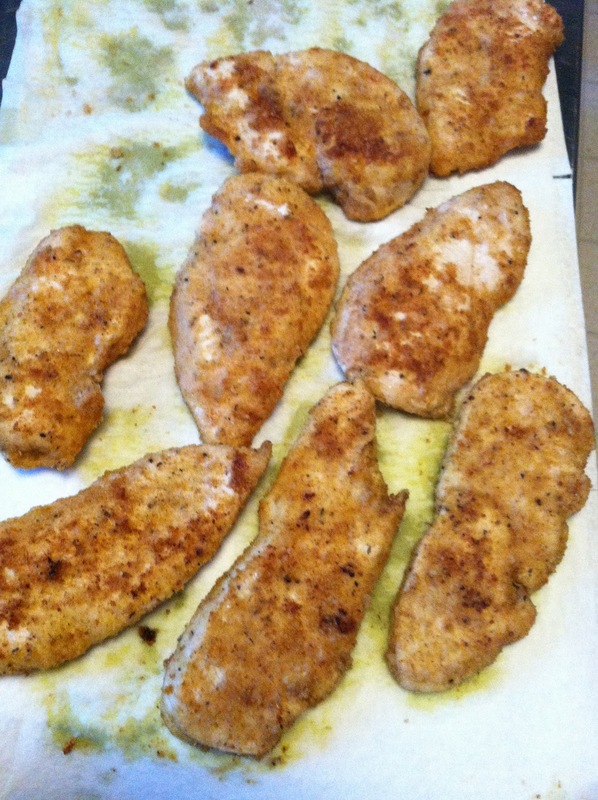 Dredge the seasoned chicken in the olive oil/lemon juice mixture, then in the bread crumbs/parmesan mixture. 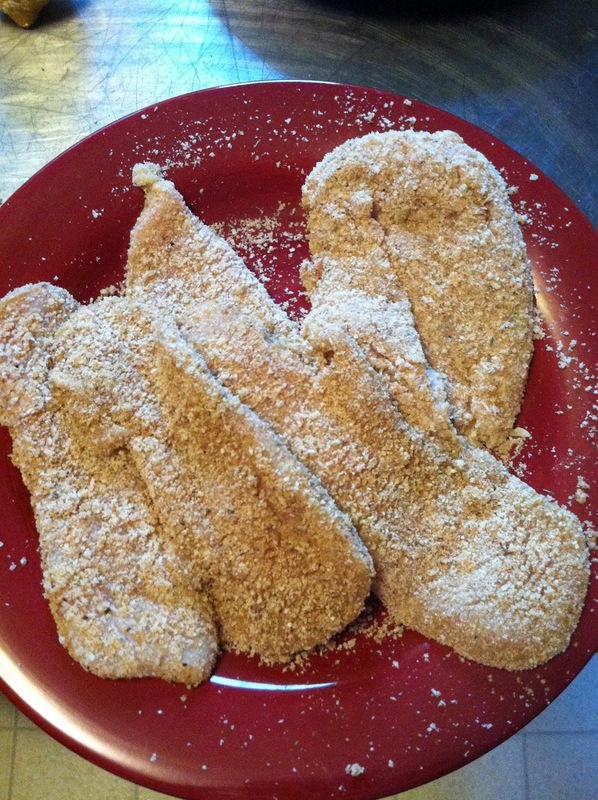 breaded chicken, ready to be cooked either in a pan or in the oven. 9. 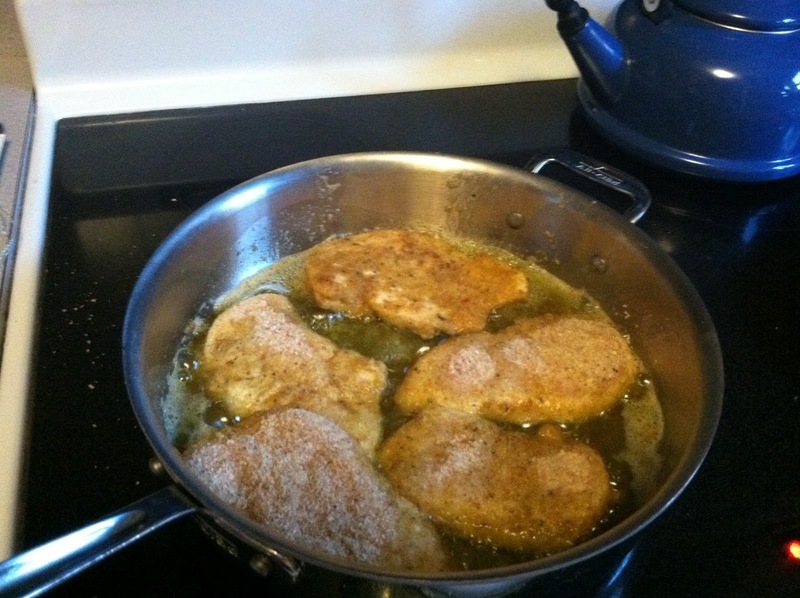 Cook in the oil (or in the oven, after spraying with Olive Oil cooking spray), flipping once, until each side is golden brown and chicken is cooked through (these cutlets were thin enough that each side took approx. 5 minutes). 11. Top chicken with arugula dressed with a simple lemon viniagrette (1 T lemon juice, 3 T olive oil, salt and pepper to taste), and then top that with the tomato/onion/garlic mixture, which at this point should be combined in a really melted down, kind of awesome little chunky “sauce”. 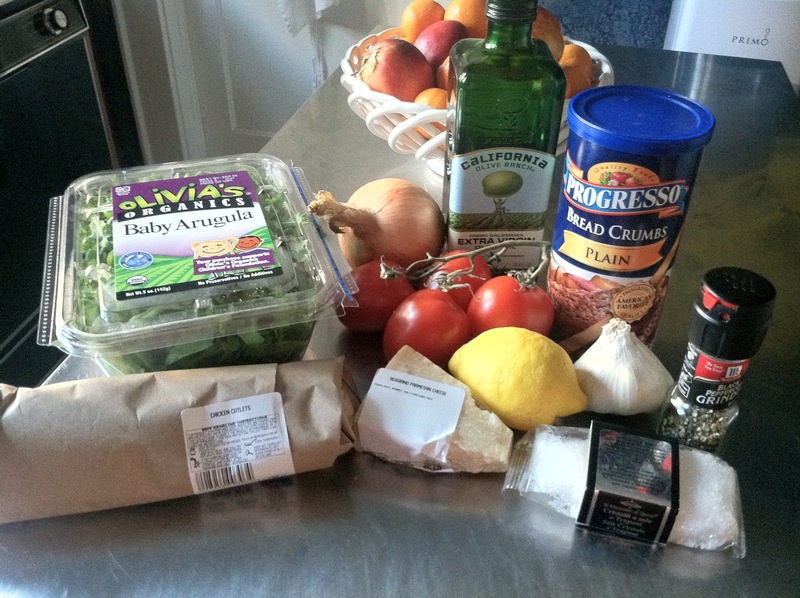 Serve with shaved curls of parmesan cheese (optional) and a lemon wedge. 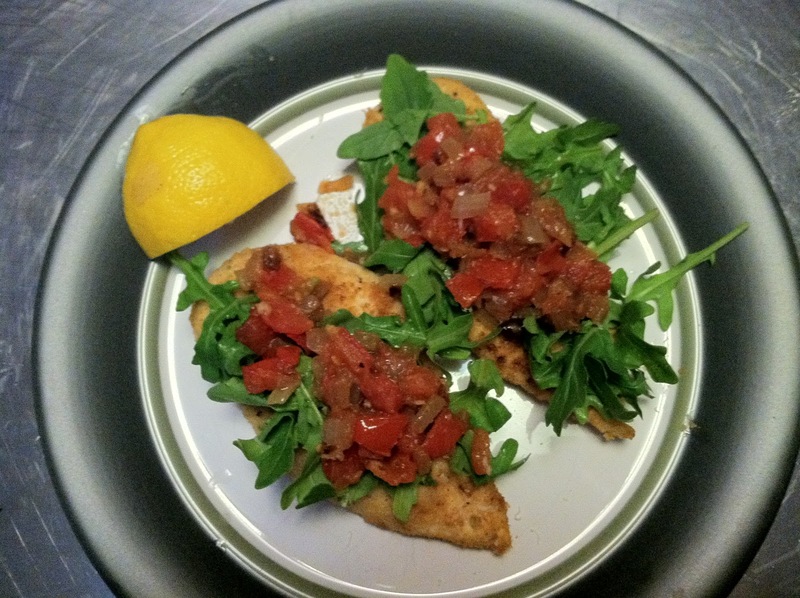 This entry was posted in arugula, chicken milanese, lemon wash on September 2, 2012 by westyn.